As I always do, or almost always, after I’d opened it, I’d put a double layer of foil over the open top, pressing the lid back in place. This works well for keeping the contents of these flat tins in good smoking condition for a week or three, and I’d fully intended to finish the tin within that time, but the best laid plans, and all that. Had I known I was going to forget about it, the tobacco would have been put into a jar for safe-keeping. On the other hand, I often forget to label these little jars, and once they get shuffled from place to place, usually separating themselves from the original tins on which they are sitting, with the tins ending up on one side of the office, and the jars on the other, I forget what they contain. Maybe it’s a blessing that I forgot to jar this one. But, how did it fare after several months of sitting? Prying off the lid and peeling away the foil, I found about 22g of very dry, crumbly tobacco. Foil covered tins, it seems, have a shelf life that’s less than months. The tobacco had a restrained, acrid smell, and had lost the fruity notes that had developed from the years of aging. There was almost no detectable Latakia aroma, and the overall aroma was flat and lifeless. This provided a perfect opportunity to do a little experimentation with re-hydration. Experiments aren’t much good if the results aren’t shared, so here’s the rest of the story. I filled a little Castello #10 with the crumbly stuff, straight from the tin, and lit up. I estimated the moisture content to be about 8%, based on the average RH (45-50%) over the past few weeks. This is quite a bit lower than the 12% I prefer for good smoking, but I’ve smoked plenty of very dry tobacco, and sometimes, the results are pretty good, so I had hope. It wasn’t a complete let-down. There were certainly some nice flavours coming through, but the overall balance was off. 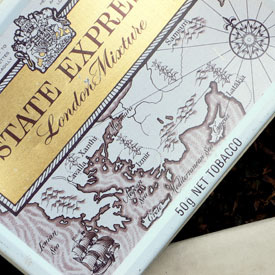 When I’d first smoked this after opening the well-aged tin, the virginias made a strong statement, with the oriental tobaccos providing interesting background spice. Now, the smoke was dominated by the slightly bitter/tart signature of the Turkish leaf, and the tobacco offered an astringent, harsh smoke that I’d not noted before. Not horrid, but certainly not what it was, nor what it could be. For the second bowl, I filled a pipe with very similar geometry and smoking characteristics, and blew though the tobacco from the bowl side to add a little moisture to it, a trick I’d learned from one my old mentors during the days of Drucquer’s. A charring light was applied, and I then let the tobacco sit for a few minutes to take up the moisture. When I re-lit, there was significantly more flavour, and a more pronounced sweetness from the virginias. The harshness was lessened, somewhat, and the smoke was less strident, and slightly better balanced. It was going in the right direction, at least. I then weighed what was left of the tobacco, 16g, and applied 2.4ml of water to it, to bring the moisture level back up to about 13%. After mixing carefully, I sealed it in a jar so the leaf could fully absorb the extra moisture and find its equilibrium. The following day, I opened the jar to see how things were coming along. The aroma in the jar was much less sharp, with less of the dusty, acrid, dried vegetal quality, and quite a bit more of the virginia’s tea-like delicacy. Of course, none of the aged-tobacco lusciousness, that fetid, fruity quality that provides so much intrigue, had returned. Those volatiles are lost forever to the aether. Still, the tobacco held promise for at least a pleasant smoke. The first pipe was again employed, and after careful filling, I looked forward to this smoke with eager anticipation, both for the information that was waiting in the wings, and for a delightful experience. At first light, the difference was profound. An almost honeyed sweetness danced on the tip of my tongue, with the orientals no longer taking centre stage. And, what’s this? Latakia? It’s back! I could actually taste it. (I didn’t mention the fact that I couldn’t taste it before, simply because it didn’t occur to me, its absence was so complete.) Much of the balance of the blend had returned, and the smoke was actually quite delightful. Smooth, well orchestrated, and brilliant. I remember why I liked this tin so much when I first opened it. Toward the middle of the bowl, however, the smoke became steamy, dilute, and more than a little hot. What had happened? I’d made no notes of this phenomenon when I’d originally smoked the stuff. After a moment’s thought, I realized my error in a head-banging instant. When I’d calculated the amount of water to add, I’d neglected to consider that the tobacco was already at about 8% moisture. Rather than raising it to 13%, I’d inadvertently brought it up to about 21% - much too high for good smoking. So, I left the tin open to allow what was left to dry down a little. For the fourth bowl, I used the second pipe again. Pow. The flavour was there, and the interplay of all the components was quite nearly as magical as I remembered, and my original notes indicated. Certainly, some of the more interesting volatile molecules had been lost forever during the drying days, and the smoke now wasn’t as complex or as rich as it had been, but it was still wonderful. I realize that I’ve said in the past that once an aged tobacco has dried out this much, it’s no longer worth smoking. I was just plain wrong. Ideally, of course, once opened, the contents of that precious vintage tin should be safely stowed in glass, and smoked up over a short period of time to prevent the loss of some of its subtle greatness, but even if it has dried to dust, all is not lost! Re-hydrated, it can be enjoyed to the last crumbs. I’m going to go out on a limb with another experiment, at significant personal sacrifice. Next time I open a vintage tin of something, I’ll take some notes, then dry it out for a week or so, re-hydrate it, and seal it back up to “re-start” the aging process. I’m curious how aging will progress the second time round. I’ll let you know what happens in five or six years. Finally, I’ll offer my preferred method of moistening tobacco in a controlled, if not scientifically precise manner. Put the tobacco in a large bowl, and cover the bowl with a moist towel (plain water is fine). Do not let the towel touch the tobacco. Over time, and it can take anywhere from hours to days, depending on how dry the tobacco is to start with, and the ambient temperature and RH, the tobacco will equilibrate with the moisture provided by the moist towel. Check it often, and re-moisten the towel if necessary. This works like a charm, and minimizes the risk of over hydration, and mold. The target is strands of tobacco that are pliable, but don’t stick together when pressed into a ball.